Before I was awake, I use to shop at Bath and Body Works because they always had good sales and the products smelled delicious. Little did I know, there were so many toxins and chemicals lurking in all of their products. The moment I became aware, I threw out all of their carginogenic products and started using products that were not only good for my family but also for the Earth as well. Today is April 1st and also the start of Earth Month. You may be proud to know that I created my VERY OWN button for Earth Month at the top of my page! How cool am I? LOL I had a little help. This AMAZING chick, Emily from http://www.emmiebee.com/ sent me a tutorial and held my hand through the process. Today also happens to be my first appointment with my midwife!! I am beyond excited! I get to see the little sesame seed for the first time today! Ok, back to me becoming aware of what I was putting onto and inside of myself. If you are like me and you are SLS, Paraben, Photoestrogen free, then you know how hard it is to find quality, all natural hand soap. You can't walk in to your local big box store and buy it, unfortunately. 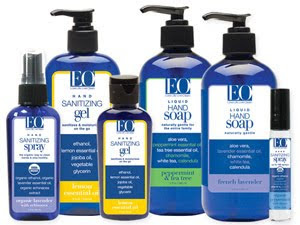 I was in need of some hand soap when I came across EO Products. I am so glad I have found them! For review they sent me a variety of hand soaps and hand sanitizers. I really love their foaming soap. The coconut and vanilla with tangerine sells so good I want to eat it. I would say it smells most like a creamsicle! Yummy! They also sent me some lavender hand soap which not only cleans and lathers real well but also smells like fresh lavender. Along with the soaps they also send some grapefruit and mint lotion. I LOVE GRAPEFRUIT! No kidding. I love the smell of it, the taste of it, everything. This makes the ideal foot rubbing lotion for my poor preggo piggies. Another item that I really like of theirs is their hand sanitizing wipes! They're perfect for in the diaper bag or in the gym bag. I like to use them even on the grocery cart before I put Dexter in. One thing that I wasn't too excited about were the mini weightless shampoo and conditioner that they sent me. My hair is super fine and it is hard to please. The scent and the products were nice but it made my fine, somewhat oily hair feel greasy. No big deal if you have dry hair or normal hair because my hair is nowhere near normal! I would like for you to head over to EO Products and tell me two products that you could not live without! Its as easy as that! Don't forget to leave your email address so I can contact you when you win! This contest will end on April 29th at NOON EST. Good Luck! It is open to US and Canadian entrants! Two products I could not live without are: (1)Grapefruit & Mint body lotion and (2)Amma's Rose perfume. I originally found your blog by doing a Yahoo search for giveaway blogs. I entered the KettleWorx giveaway. I entered the Thera Wise giveaway. I entered teh BedVoyage giveaway. I entered the Orignial Sprout giveaway. I think the Chamomile & Honey Restorative Conditioner and the French Lavender Body Lotion both sound like something I would like. I like the Countertop Spray and Coconut, Vanilla with Organic Tangerine Foaming Hand & Body Soap :) *Thanks* for the giveaway! the all-purpose soap and countertop spray look great! I keep the lavender hand sanitizer on my desk, it smells wonderful! 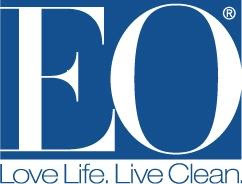 I use their wipes and also keep a small spray sanitizer in my purse (yes, I love the EO products!) I have not yet tried their lotions yet, the grapefruit sounds very nice. Thank you for the opportunity! I would love to try the unscented hand soap with coconut milk. The bubble bath in be well sounds great too. I love bubble bath! I cannot live without Burt's Bees Lip glosses and Aveda hand cream. I just couldn't live without the Rose Geranium and Citrus Bubble Bath and the Citrus Fusion shower gel. I found your great site via CoolCanucks. I entered your Livie and Luca giveaway. I follow you with google connect! I subscribe to your feedburner email! I found your site through talking to you at eco store! I entered your car seat giveaway! I entered your original sprout giveaway! I entered your livie & luca giveaway! I would like to try the hand sanitizer and the Wild Lime and Ginger Hair Repair. The Chamomile & Honey Restorative Conditioner and the Wild Lime and Ginger Hair Repair. Body Polish and Bubble Bath are two items I want to have. I found your site thru Google. I entered Original Sprouts giveaway. I'd like to try the Rose & Chamomile hair conditioner and the Wild Lime & Ginger hair treatment. The Jasmine Body Lotion - 8 oz and Greenwood Naturals All Purpose Cleaner - 32 oz look great! I entered your Original Sprout giveaway. I found you on Prizey.net. I would love Amma's Rose Perfume and the EO Hand Sanitizer. Thanks! Two products I could not live without: Hinoki & Ginger Bubble Bath and Lemon Verbena Hand Cream. The Unscented Hand Soap w/ Coconut Milk and the Chamomile & Honey Conditioner both sound great. I would love to try the Body Lotion - 8 oz Rose Geranium & Citrus and the Organic Bath Salts - 21.5 oz French Lavender. I follow you on Good Friend Connect. I subscribed to your blog via email (entry 1). I subscribed to your blog via email (entry 2). I need Hand Cream and a nice Bubble Bath. The lavender body lotion and deodorant bar soap are two EO products that I currently use and seriously would miss if I had to live without them! I also entered your Earth Mama Angel Baby giveaway, thanks! The first product would be Amma's Rose - 0.4 oz. I love perfumes. The second product would be their Nighty Nite bubble bath. I subscribe to your Feedburner Email Subscriptions. I found your site via Prizey. I entered the Little Green Books Collection giveaway. I entered the Livie and Luca Shoes giveaway. I entered the Boy's Store giveaway. I entered the be present Organic Yoga Tank giveaway.